The new Danish stamps issued during this period featured lower-denomination numeral-type definitive stamps, provisionally revalued definitive stamps, and the first Danish postage stamps to feature the portrait of the reigning monarch. Two paper watermarks were used for Danish stamps between 1905 and 1917, and they are both shown above. They will be referred to by their WMK numbers in the descriptions below. Only the major denominations and colors will be shown in the images below. The production varieties of these definitive postage stamps will be indicated in the catalog detail tables. 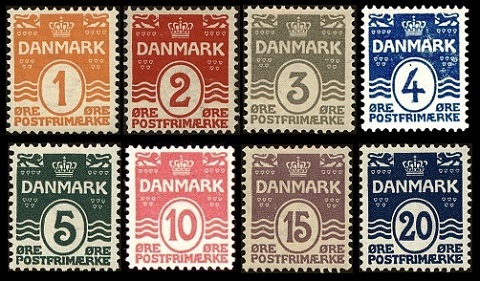 The eight lower-denomination definitive Danish stamps shown above were issued between 1905 and 1917. This definitive stamp design, with various production modifications, would remain in use, for lower-denominations, well into the 20th Century. At the top, these stamps feature heraldic lions on either side of a crown. In the middle, they feature a large denomination numeral, within an oval, and waves on either side. The waves are symbolic of the three waters that separate the principal Danish islands. 01 Ø. (1906 - Sc. #57) - Orange. 02 Ø. (1905 - Sc. #58) - Carmine. 03 Ø. (1905 - Sc. #59) - Gray. 04 Ø. (1905 - Sc. #60) - Dull Blue. 05 Ø. (1912 - Sc. #61) - Deep Green. 10 Ø. (1912 - Sc. #62) - Deep Rose. 15 Ø. (1905 - Sc. #63) - Lilac. 20 Ø. (1912 - Sc. #64) - Dark Blue. 02 Ø. (1917 - Sc. #58a) - Carmine. 04 Ø. (1917 - Sc. #60a) - Dull Blue. 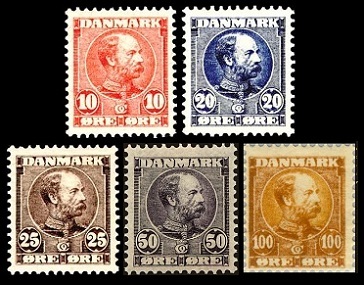 The five portrait definitive Danish stamps shown above were issued between 1904 and 1906. These stamps are all engraved, perforated 13 and printed on paper with WMK 113. These stamps feature the right-facing portrait of King Christian IX. These are the first Danish definitive postage stamps to feature the portrait of a reigning monarch. 010 Ø. (1904 - Sc. #65) - Scarlet. 020 Ø. (1904 - Sc. #66) - Blue. 025 Ø. (1905 - Sc. #67) - Brown. 050 Ø. (1905 - Sc. #68) - Dull Violet. 100 Ø. (1905 - Sc. #69) - Ocher. 005 Ø. (1905 - Sc. #70) - Green. 010 Ø. (1906 - Sc. #71) - Scarlet. 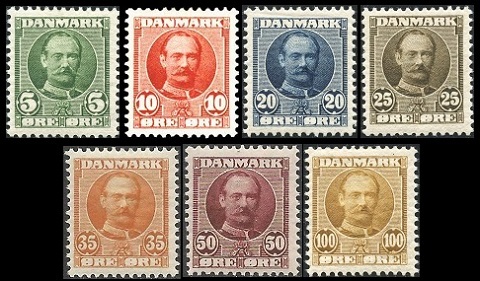 The seven portrait definitive Danish stamps shown above were issued between 1907 and 1912. These stamps are all engraved, perforated 13 and printed on paper with WMK 113. These stamps feature the facing portrait of King Frederik VIII. 005 Ø. (1907 - Sc. #72) - Green. 010 Ø. (1907 - Sc. #73) - Red. 020 Ø. (1907 - Sc. #74) - Indigo, Bright Blue. 025 Ø. (1907 - Sc. #75) - Olive Brown. 035 Ø. (1912 - Sc. #76) - Deep Orange. 050 Ø. (1907 - Sc. #77) - Claret. 100 Ø. (1907 - Sc. #78) - Bister Brown. A shortage of 035 Ø. stamps necessitated the provisional overprinting and revaluation of the three obsolete definitive stamps shown above during 1912. 35 Ø. on 16 Ø. (1912 - Sc. #79) - Slate & Brown. 35 Ø. on 20 Ø. (1912 - Sc. #80) - Rose & Gray. 35 Ø. on 32 Ø. (1912 - Sc. #81) - Green. The Five Kroner pictorial definitive stamp shown above was issued on September 16, 1912. This stamp is engraved, perforated 13 and printed on paper with WMK 113. The central design of this stamp features the General Post Office in Copenhagen. 05 K. (1912 - Sc. #82) - Red. 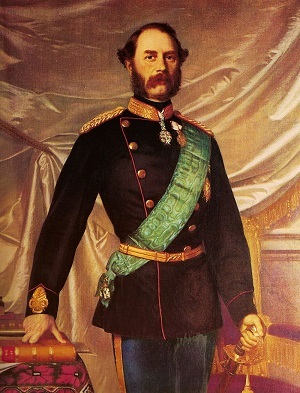 Christian (1818-1906) reigned as King Christian IX of Denmark from 1863 to 1906. Christian was not actually in the line-of-succession to the Danish throne. King Frederik VII of Denmark (1808-1863), who was unable to father children, chose Christian as his heir-presumptive in 1853. By the time his portrait first appeared on Danish postage stamps, Christian was already 85 years old. He died of natural causes on January 29, 1906, barely two years after the postage stamps with his portrait were issued. 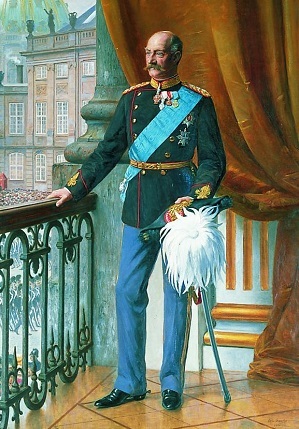 King Christian IX was succeeded by his oldest son, Frederik (1843-1912), who ascended to the Danish throne as King Frederik VIII. Christian Frederik Vilhelm Carl (1843-1912) reigned as King Frederik VIII of Denmark from 1906 to 1912. Due to his father's longevity, Frederik served as Crown Prince for 43 years, and when he finally succeeded to the throne of Denmark, he was already 62 years old. Being 68 years old and in ill health, Frederik was taking a walk through a park during a visit to Hamburg on May 14, 1912, when he collapsed on a bench and died from what is believed to be a seizure. King Frederik VIII was succeeded by his oldest son, Christian (1870-1947), who ascended to the Danish throne as King Christian X.